The Noblest of Animals: The Horse, ‘Breed’ and British National Identity, 1900 to 1914. I’ll let you all know once it’s published. Meanwhile, back to the book proposal… TTFN! This week, the ongoing saga of the publishing proposal took a new and interesting turn. Feeling that my project as it stands would be too “narrow”, my (hopefully) publisher have suggested that I might like to expand it to cover The Boer War, The Great War AND The Second World War. My first reaction was one of, I have to confess, utter horror. However, after a brief foray into the archives and a preliminary snoop about, the idea of delving into the soldier-horse relationship post-1939 really appeals. Already, interesting material is revealing itself. Not least, some very interesting interviews with veterans, who all talk about the respectful approach to their mules that soldiers quickly came to find worked the best. I have never met a mule, but I imagine they prefer to be ‘asked’ rather than ‘told’. Who was ‘the boss’ in this relationship is debatable, but I would be inclined to suggest that it was the soldiers who worked with the mules and that it was the mules who, in fact, did most of the training. So, the next task is to review (again), revise (yet again) and resubmit (third time lucky?) my proposal and hope that this time it gets the go-ahead. Fingers crossed! Last week Matt Edwards and I finished working on ‘Horses and Stables’. We used a similar approach to ‘Animal Management 1933’. I think it is safe to say that what we have achieved is nothing if not miraculous. What an improvement! This isn’t a particularly valuable or rare title, but it is one that I have used a lot in my work, and continue to use on a regular basis. I would like to think that Colonel Fitzwygram would have been pleased to see his excellent book still being read, and admired, in the twenty first century. Here’s to another hundred and something years! This is Colonel Frederick Fitzwygram’s wonderful book on horse and stable management. First published in 1862, it was in print well into the 1900s. Fitzwygram was influential in improving veterinary care in the British Army. He had a particular interest in farriery – I believe there is a shoe named after him. Fitzwygram also advocated the good care of all horses. Although his advice has of course dated in some respects, and certainly in terms of the treatments that are now available to veterinarians, much of what he has to say is just as valid today as it was in 1862. Pictured, is my copy of Horses and Stables which was purchased in a second-hand bookshop in London (for a song) about ten years ago. Little knowing that it would become one of the books I would endlessly refer to during my research! These are no doubt simple recipes for successful stable management, – too simple perhaps for many, who believe that there is a mystery in stable management known only to a few. Yet from neglect of these common and obvious requirements, few horses look as well as they ought to do. Many become sick or lame, and thus entail trouble, expense, and loss, which might easily have been avoided. To ensure the highest development of health and strength, not one or two or even three of these essentials are sufficient, but all must be combined. Your cannot have strength in a chain, if any one link be defective. 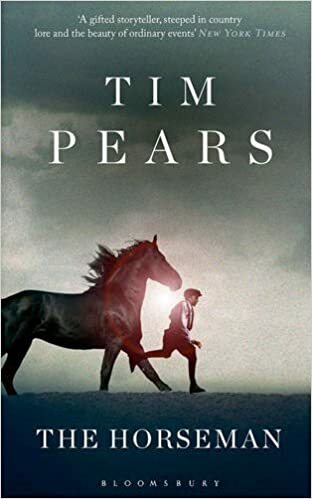 If you are the sort of horse person who notices when Poldark’s horse keeps changing colour, or that the horse Merlin set off on several hours ago (usually at a gallop) is miraculously still also trotting about in Camelot, then you’ll enjoy Tim Pears’ The Horseman. It proceeds at a steady pace, with lots of wonderfully wrought horse-centric details. The story is set in the early twentieth century and centres around a boy called Leo and his love of the horses around him. I say it is steady, but perhaps evocative and stately would be more appropriate. But don’t be fooled, there is drama too. ((I won’t spoil it.) Published by Bloomsbury.